Up down, up down as the see-saw for the equity markets continues. 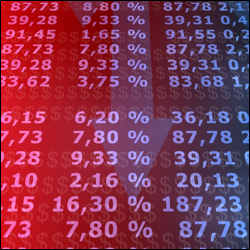 The Dow Jones managed to put in a half decent gain last night and Asian indices complimented that so European indices are just about in the black. Once again however we had been calling the FTSE to open much higher. At one point in the early hours, our quote reached 5500 but then slowly and surely we drifted back from there. So at the time of writing the FTSE is just a little higher, at 5455, so hardly a convincing move from the buyers. For the index the 5400 level remains the critical support area of the moment. Technical analysis of the hourly chart shows that a double bottom has formed at almost exactly the same level and so at least this is an area where some buyers are coming back in. This isn't to say that it will hold going forward and higher prices are to come, as we've seen in the past many of the recent rallies have been very short lived. What it probably does mean is that a break to the downside, and a close below here, could spell trouble for the bulls. Something will have to trigger this move of course and with so much uncertainty out there at the moment you could almost take your pick as to what that trigger might be. Lots of moves on the political stages of Greece and Italy and so for now the markets seem to be giving the Eurozone another benefit of the doubt. A heavyweight ex EU commissioner is expected to get the top spot in Italy and Greece has finally picked someone to lead after days without a Prime Minister. Hopefully this puts a little bit of clear blue water between the politicians and the markets, but more importantly today is the votes on Italian economic reform. Of course passing austerity packages is all very well, but that doesn't do much to help growth, which is fast becoming the really worry for investors. Throughout the last few months downgrade after downgrade has been made to European, US and even Chinese GDP with the chances of actual recessions becoming very real. As a result, the indices markets are finding bullish account holders to be few and far between. On the whole, clients are only slightly long of European indices, the FTSE and the DAX, and slightly short of the main US indices. Fear is gripping investors at the moment as the Eurozone debt crisis seems to be getting out of control. Politicians in the US are now trying to calm nerves by saying that their exposure to Italian debt is wholly containable and that their banks will be able to weather the storm in the event of any default. Indices were in sell mode throughout last night's session in New York and this morning this has followed through to the start of European trade. For the FTSE 100 we've been calling it to open below the important support level of 5400 throughout the night and at the open we're trading at 5360. This breach of 5400 is worrying for the bulls who've been citing this as the previous resistance, turned major support level. So now the focus is going to be on the 5330/00 and 5270 area and then of course it's the major low around 4800. The bears seem to be very much in control of proceedings and if the fear grows we could be testing the resolve of these support areas. The Wall Street index saw gains overnight, on the news that Silvio Berlusconi will be stepping down as Italian Prime Minister, pushing above its 200 day moving average. The FTSE 100 remains some way from its own 200 DMA, which is around 5700, and is now seeing some of its early strength fading. At the time of writing the FTSE is below the 5600 level at 5575. Even if a few sellers are creeping in early on it must be demoralising for Italy's Prime Minister to see that shares markets have held up pretty well considering his announcement to resign. The bond yields on Italian debt remain at worrying levels; however they haven't quite jumped up to the really critical 7% level yet, seen as the bailout level, so investors are still giving them the benefit of doubt. The gloom for the UK consumer and high street continues with no signs of improvement. The concern for many retailers is that they face an uphill battle in the run up to this Christmas with consumers tightening their belts significantly. Not only will smaller independent retailers struggle but big ticket items are not expected to do well. New dish washers, televisions and fridges are the last thing on people's minds at the moment and, with a housing market that is still heading lower outside London, these items will remain a no go area for consumers. Those retailers who don't have exposure to emerging markets and are just cooped up in the UK are going to find things hard going forward. It seems that discretionary spending has almost totally disappeared, unless you are one of the few who can afford the finer things in life such as the Burberry coat, Boodles jewellery or a new Ferrari. Top end items have not suffered anywhere near the sort of decrease in sales seen elsewhere as the super rich continues to spend, spend, spend. Despite the tough headwinds faced by the high street, the UK markets don't seem to be taking any notice. The FTSE continues to be relatively well supported and, since bouncing off the important support level around 5400, it has oscillated around 5500. This morning we seeing a few tentative buyers push us a few points higher to 5550 at the time of writing. All eyes are on Italy today as Berlusconi is having his premiership put to the test. Rumours that he'll step down have been doing the rounds this morning which gives a little indication as to what the markets think of his leadership. Italian government bonds will also be closely watched, as yields have retraced from their earlier highs on the resignation rumours. It's amazing how a leader of one of the world's biggest economies now uses his Facebook page to reject the rumours. The markets commence this week with what would seem like a political deal in Greece. The country now looks likely to receive its next bailout payment and so the focus shifts back to Italy, which was one of the hotly discussed topics of the G20 at the end of last week. This morning our earlier opening calls have proved to be far too optimistic, having expected the FTSE to start higher by some 20 points only for it to open the session lower by about the same amount. This has taken us to the 5500 level at the time of writing and can be blamed on rather an inauspicious start to the week by Italian government bonds. The bonds markets have seen Italian yields break beyond their highest levels of the year, causing serious concern ahead of an important budget vote there tomorrow. So a bout of risk aversion is getting this week underway following the volatility of last week which saw investors attempting to recoup the losses that saw October end on rather a sour note. The market was hardly inspired by a Non Farm Payroll figure, that came in worse than expected, and the G20 summit fell flat on its face with little agreement as to how to save Europe. That's the bottom line and, with Greece stealing the show, it's hardly surprising that the BRICs were jumping over themselves to pump funds into the EFSF. As Obama himself pointed out, there are so many variables when it comes to Europe. When you think one thing has been agreed and then a national government goes and does another to save its own skin, how can that possibly inspire confidence for would be investors. As mentioned, the FTSE is a little lower than expected on the indices markets and has been weakening even in the time that it has taken me to write this much so we are now at 5470 as the risk aversion continues. This area we're sitting on is a near term minor support level with 5370 and then 5320 below here being the next support levels. To the upside, which looks ambitious at the moment, 5600 and 5655 are seen as the near term resistance. Over the longer term for the index the big question is still whether we're in a bear market rally or we are just gearing up for the usual end of year rally. Major levels remain 4800 to the downside and 5760 to the upside. There's little in the way of any economic data out today but investors might watch out for EU retail sales and German industrial production this morning. As the Greek Prime Minister digs his own political grave, the Eurozone saga continues to overshadow the G20 meeting in France. As the story continues it becomes more and more interesting with the prospect of the drama intensifying with crucial votes ahead, one of the major ones being Italy. Berlusconi is hanging onto power by the skin of his teeth, after defection after defection from his coalition, and he faces his own critical vote next Tuesday when he tries to ratify his latest budget proposals. That will be interesting when it comes to it and all eyes will be on the Italian politicians. This is why the drama has only just begun, with an unwritten script that no single person could ever have dreamt up. If the vote does go against Berlusconi then there's no guarantee he'll step down, judging by the way he's managed to stay in office up to now. As the meetings go on at the G20, the market continues to focus on what's happening in Europe. However, today at least gives us the chance to look at something different, with the US Non Farm Payroll being released at lunchtime today. It's an hour earlier than normal this week due to changing clocks and the bottom line figure is expected to come in at around 100k. This still isn't enough to put a dent in the US unemployment rate but is job creation nonetheless. The NFP figure has been almost as volatile as the stock market indices themselves coming in at 0 one month, way below expectations and then way above expectations the next month. So far this week we have seen a better than expected ADP employment number and yesterday's initial jobless claims also saw an improvement, so there's a chance that today's figure might come out above three figures. The unemployment rate meanwhile is expected to remain at 9.1%, a thorn in the side of President Obama. Financial markets are sanguine this morning from a trading range point of view but in the black as investors have weathered the political unravelling of the past few days remarkably well. The FTSE 100 is up by 10 or so points at the time of writing, around 5560 and for now that important support area around 5400 remains in tact. The drama continues as now the Greek Prime minister is being pressured to turn his referendum into a yes or no vote on membership of the euro as opposed to just the latest bailout. These political games are costing the Eurozone dear as once again we see the bond yields rise on Italian 10 year debt. Investors are really starting to lose faith in the whole EU project and the cracks are beginning to show as Italy's latest bond auction was not a successful one. In addition, demand for EFSF bonds has fallen flat on its face, the lukewarm response to the EU summit plans from China and Japan are a worry and the bond yields for the danger zone states carry on higher. Greece had its latest tranche of bailout funds taken away from it ahead of the referendum, which is expected early next month. This is cutting it fine for the country which will default then if it doesn't get it. The timing is becoming a real issue now as the market is becoming more and more reluctant to lend to the likes of Italy and Spain which are swiftly becoming the major issues for the Eurozone. So it'll be touch and go as to whether Greece defaults or not and if the worst case scenario does happen then that's when things will really start to get ugly. A non-voluntary default will trigger CDSs for which the black hole is impossible to know how deep it goes, particularly if this were to trigger the contagion that everyone fears so much. This could trigger a Lehman situation on a sovereign scale. Unsurprisingly the FTSE 100 is a little lower this morning, wiping out its gains from yesterday as investors closely watch the G20 meeting get underway. After the selling of yesterday, the FTSE 100 is a little higher this morning taking us back to the mid 5400 area. At the time of writing it is bang on 5450 and this 5400 area is where the index found it so hard to break through to the upside throughout August and September. The theory goes that past resistance becomes future support and so buyers are being attracted back, tentatively expecting 5400 to hold firm. Having said that, I suspect many will be keeping close guaranteed stop loss orders below this level in case more crashing ensues. The FTSE 100 has started the day on the back foot after some weak manufacturing data was released from China. This hasn't been complimented by the OECD's gloomy outlook on growth in the Eurozone after they said they expect the odd little dip back into recession over the next year although an 'official' one should be avoided. This morning we also get the release of the first reading of Q3 GDP from the UK. Whilst we're not expecting any negative growth, we're not going to see any fireworks either although the figure might possibly come in better than market consensus. All in all though it means that the UK economy is flat lining, something the coalition government will be blamed for on government cuts, which are still nowhere near as bad as everyone is hyping them up to be. The problem of no growth is that the deficit reduction plans are not going to hit their targets and that could make bond markets think again, which up until now have given us the benefit of the doubt. At the same time as the GDP figure, we get UK manufacturing PMI which is expected to just about remain above the 50.0 mark indicating expansion. Then later on it's the US's turn to paint their picture for manufacturing. Later this evening Federal Reserve chairman Ben Bernanke will give a press conference and this will be closely watched to see just how far he'll go in lowering his growth forecasts and increasing unemployment predictions. The FTSE spread trading market seems to have given up the ghost on trying to record its second best monthly gain on record as the euphoria from last week's EU summit rubs off. European leaders and officials have been going cap in hand to Asia hoping that they will write us a blank cheque and we'll give them a big IOU in return. However, for some reason, the likes of China and Japan seem reluctant to show their support. Hmm, I wonder why when you see the damage that the crisis has done to confidence so far, causing the threat of a double dip recession in Europe to become more real than ever. On top of this of course, investors in Greek debt have had their investments chopped in half. Without any details of how the EFSF will be leveraged to one trillion euros, investors have been left having to wave their fingers in the air as to how a crucial part of the plan will be achieved. Details should be forthcoming at the end of this week at the G20 meeting on Thursday and Friday, yet another photograph opportunity, but as we've seen all too often before these summits are usually thin in this area. Selling in metals has led to selling pressure on mining stocks today which saw big gains last week. They are very much on the back foot today and it's the defensives that are making ground. As October comes to an end it will be remembered once more for it volatility, but this time for the tremendous gains in the indices markets. With November and the end of 2011 around the corner, bulls who have missed out on much of this bounce so far will be asking whether it's worth buying at these levels. This will be the case even if November and December are historically very bullish months for stock market indices. The rally has taken the daily chart back to the 200 day moving average which is where we've seen this halt in the buying. If we are indeed in a bear market then often we see bounces take us to test this level before giving up and heading back down again. Considering the speed with which we've seen the indices get back to these levels it's hard to think that we could test the lows around 4800 again this year. However, markets tend to fall quicker than they rise so it can't be ruled out.